Steering Committee members (left to right) Sean Campbell from Caltrans Division of Research and Innovation, Ian Turnbull from Caltrans District 2, and Doug Galarus, Western Transportation Institute, welcome participants to the 2011 Forum and kick off the event with background and expectations for the Forum. Attendees were awarded a certificate of participation that recognized the number of years each individual had attended the Forum. 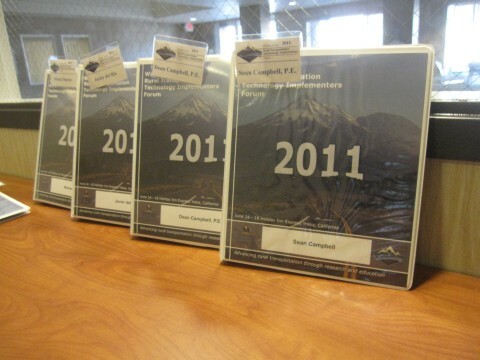 Five of this year’s participants have attended all six Forums. 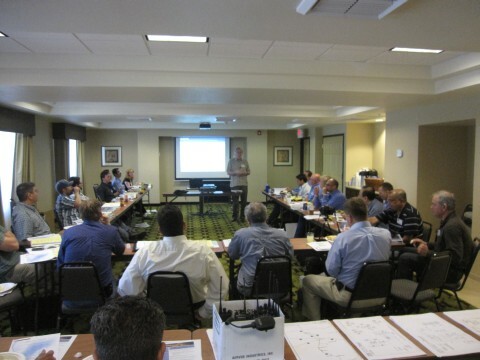 Just over half were attending for the first or second time. Special recognition was given to Ian Turnbull from Caltrans District 2 for his continued support and guidance in making the Western States Forum an annual success. 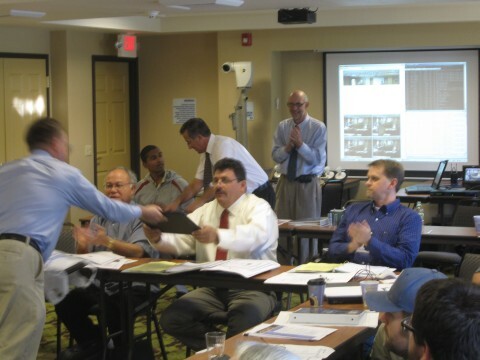 Special recognition was given to Sean Campbell from Caltrans Division of Research and Innovation for his continued support and guidance in making the Western States Forum an annual success. 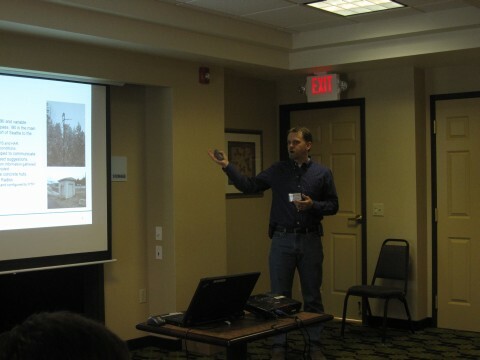 Tim McDowell, Washington State DOT, kicked off the technical presentations with his detailed discussion of the wireless data communications systems developed and used for Washington’s rural ITS projects. 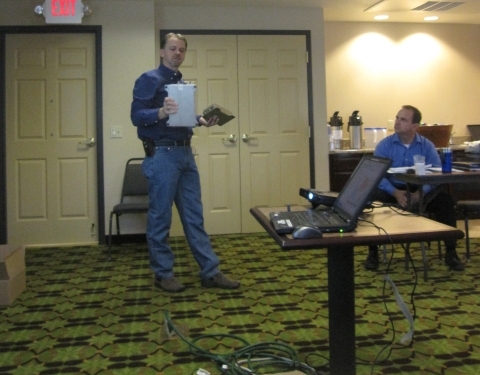 Here Tim shows several radios used by WSDOT. 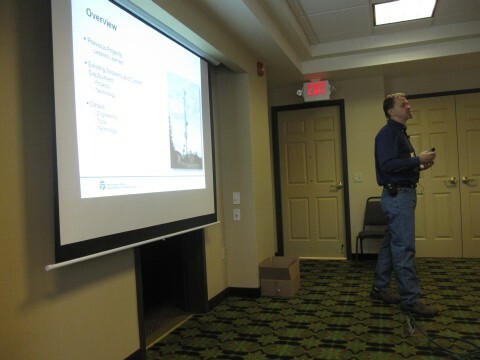 Tim McDowell gives an overview of his technical presentation on Washington State DOT’s wireless data communications systems. 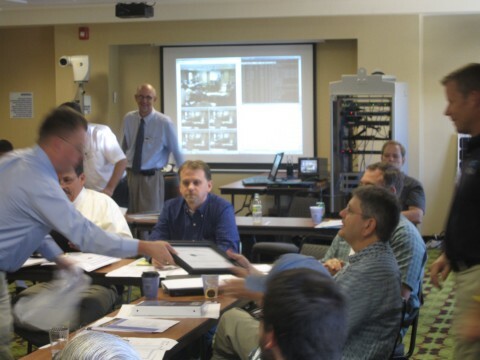 Tim McDowell describes some of Washington State DOT’s previous communications projects and lessons learned as introduction to discussion about the wireless data communications systems WSDOT is implementing and has currently deployed. 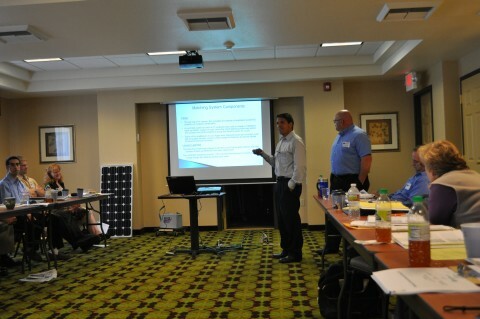 Mark Aragon and Jon Dickinson teamed up for a technical presentation about Nevada DOT’s deployments of photovoltaic power systems for Rural ITS devices. 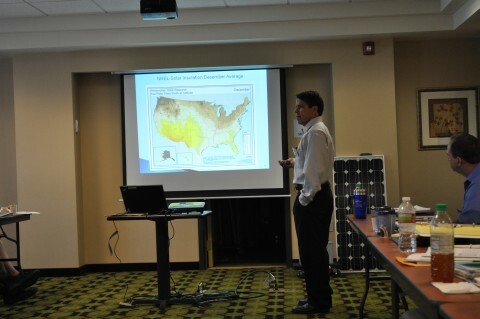 Mark Aragon, Nevada DOT, shows solar insolation maps during his team’s technical presentation on photovoltaic power systems for Rural ITS. 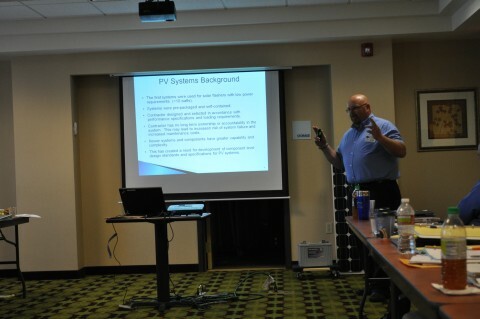 Jon Dickinson, Nevada DOT, provides background on photovoltaic power systems during his team’s technical presentation. 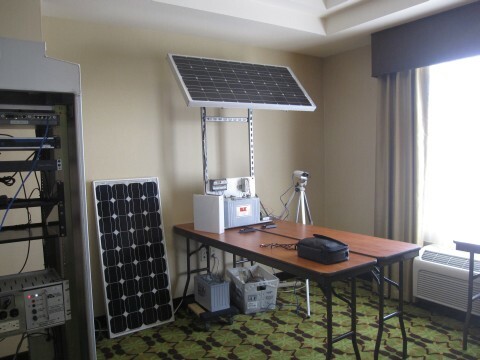 The Nevada DOT team passed around a solar panel and battery while discussing the use of photovoltaic power systems for Rural ITS devices. 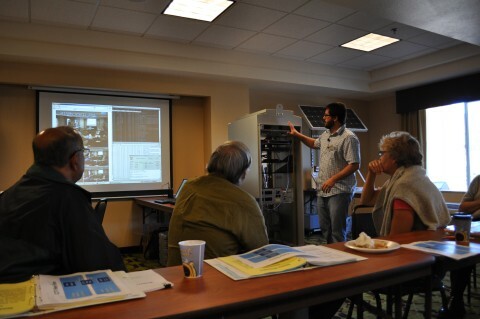 A system demonstration was also set up during the Forum. 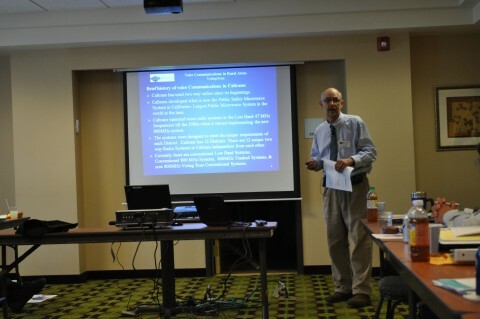 John Schmidt, Caltrans Headquarters Office of Radio Communications, explains a brief history of voice communications in Caltrans during his team’s presentation on 800 MHz voting scan communications technology. 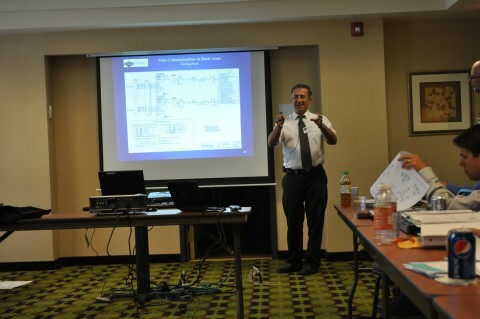 Javier del Rio, Caltrans Headquarters Office of Radio Communications, describes the Sugarloaf Mountain interconnect diagram during his team’s presentation on voting scan voice communications. 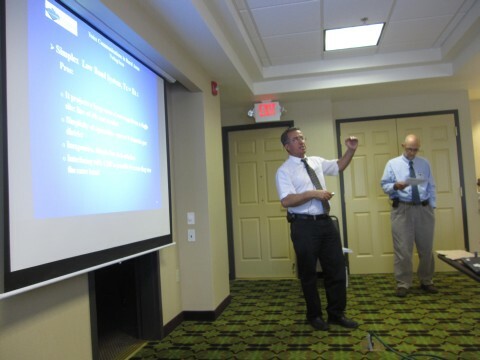 Javier del Rio (l) and John Schmidt (r) from Caltrans presented the voting scan voice communications system they are working to develop and deploy. 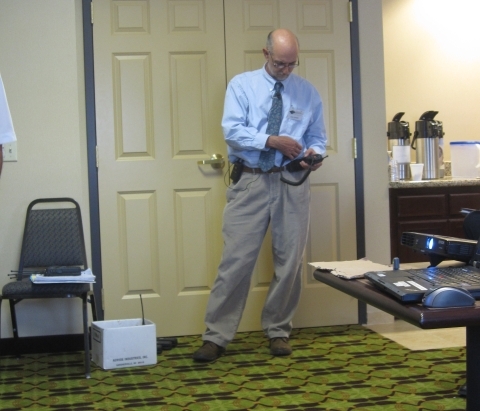 As part of their presentation on voting scan technology for voice communications, John Schmidt (pictured) and Javier del Rio from Caltrans briefly demonstrated the system with their two-way radios. 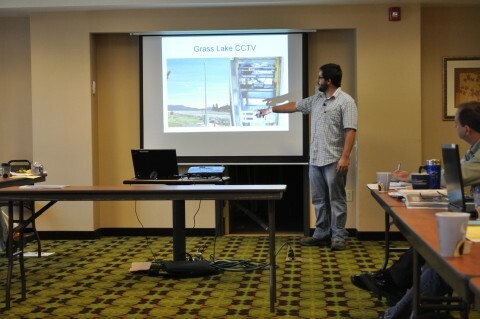 This year’s Forum participants listened to and discussed nine technical presentations and demonstrations detailing different ITS projects deployed in the western states area. John Castro from Caltrans District 10 introduces the Intelligent Roadway Information System (IRIS) project, an open-source advanced traffic management system, that District 10 is beginning to test. 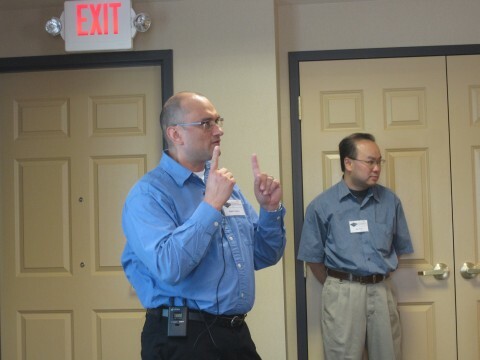 John Castro, Caltrans District 10, gestures as he discusses the development of the IRIS Open Advanced Traffic Management System and its use in District 10. Michael Darter, formerly part of AHMCT at UC Davis, demonstrates the IRIS open advanced traffic management system he helped develop for Caltrans. 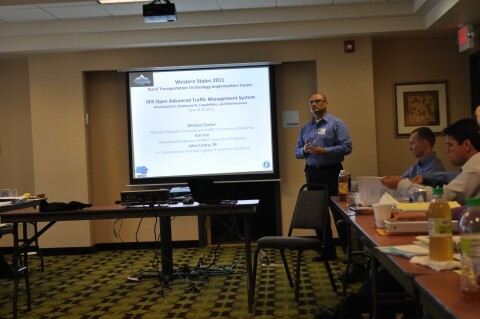 Michael Darter, formerly with AHMCT at UC Davis and now with Berkeley Transportation Systems, answers questions from the Forum participants about the IRIS open advanced traffic management system he helped develop for Caltrans. 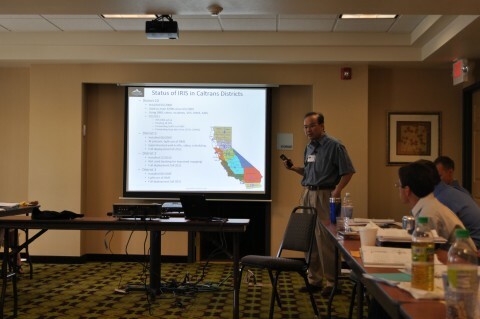 Kin Yen from the Advanced Highway Maintenance & Construction Technology Research Center (AHMCT) at the University of California-Davis, shows the status of IRIS implementation in the various Caltrans Districts. One of the basic tenets of the Forum is transparency, certainly about what worked but also about what didn’t work. 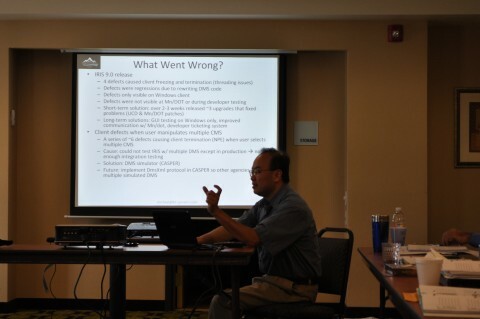 Here, Kin Yen, AHMCT at UC Davis, describes some of the challenges with the IRIS project and how the project team addressed the problems that arose. Keith Koeppen from Caltrans District 2 introduces his presentation by explaining the operational situation that led to the Information Relay he helped develop. 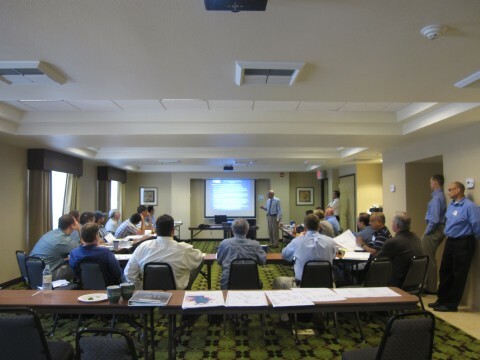 Another tenet of the Forum is to discuss actual projects that have been deployed. 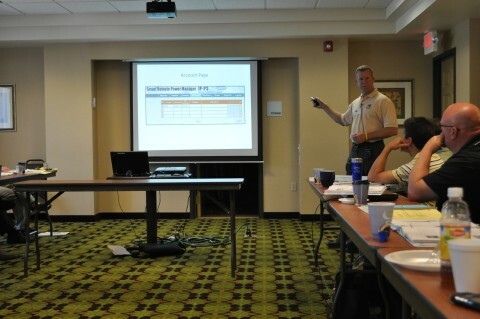 Here, Keith Koeppen from Caltrans District 2 shows the field site hardware he just described. 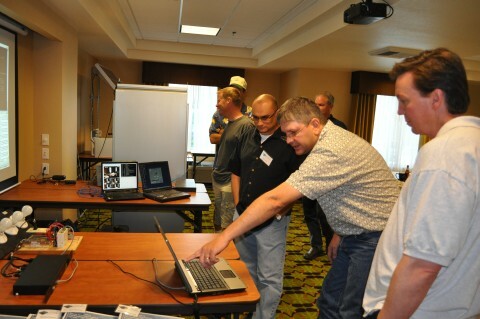 Live demonstrations have been an integral part of the last several Forums. 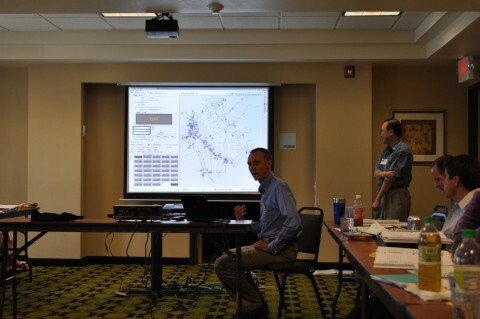 Keith Koeppen, Caltrans District 2, demonstrates the Information Relay his team developed and deployed. Dean Campbell, Caltrans District 3, teamed up with Sean Campbell from Caltrans Division of Research and Innovation (DRI) to explain and demonstrate a remote power controller with telephone and internet control functions that can reduce or eliminate the need for personnel callouts to rural ITS field elements. 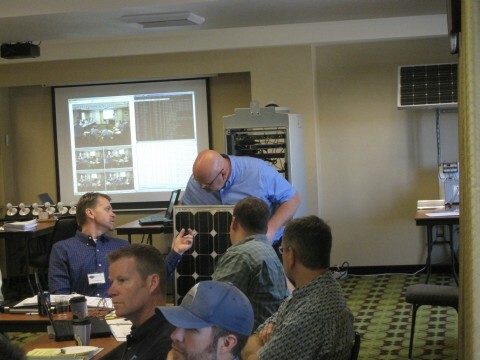 Sean Campbell, Caltrans DRI, teamed up with Dean Campbell from Caltrans District 3 to explain and demonstrate a remote power controller with telephone and internet control functions that can reduce or eliminate the need for personnel callouts to rural ITS field elements. 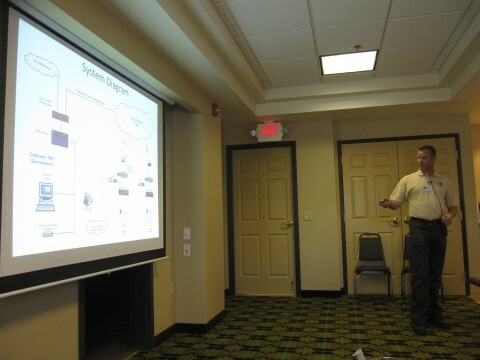 Dean Campbell, Caltrans District 3, shows the system architecture for the remote power controller that he is using in his district to reduce the number of personnel callouts to rural ITS field elements. Live demonstrations are an important aspect of the Forum. 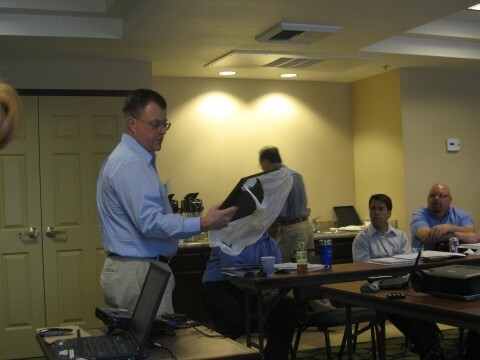 Here, Sean Campbell from Caltrans Division of Research and Innovation demonstrates a remote power controller system with telephone and internet control functions. 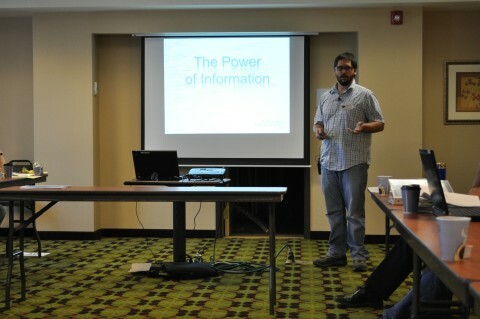 Five universities participated in this year’s Forum and three gave presentations. 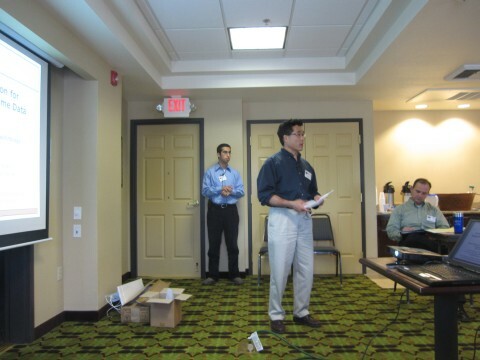 Here, David Kim, an Associate Professor from the School of Mechanical, Industrial & Manufacturing Engineering at Oregon State University, takes questions from the audience as he explains test results from his team’s project that characterized various antennas for Bluetooth-based travel time data collection. 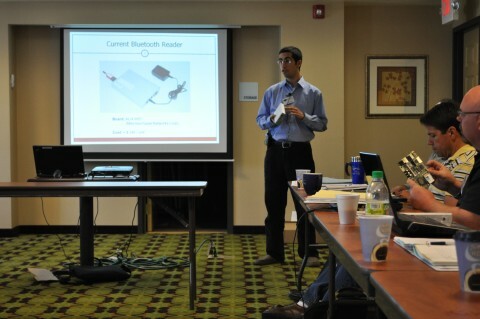 Oregon State University graduate student Amirali Saeedi shows the Bluetooth reader used in their antenna characterization testing. 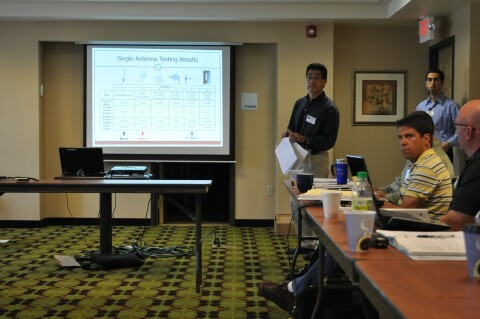 David Kim, Oregon State University, provides background on his team’s project that compared the effect of characteristics of various antennas on travel time data collected using Bluetooth-based technology. 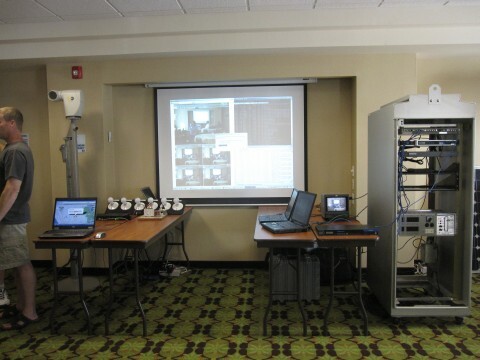 The Oregon State University team passed around several of the antennas tested during their project as well as the Bluetooth reader device. 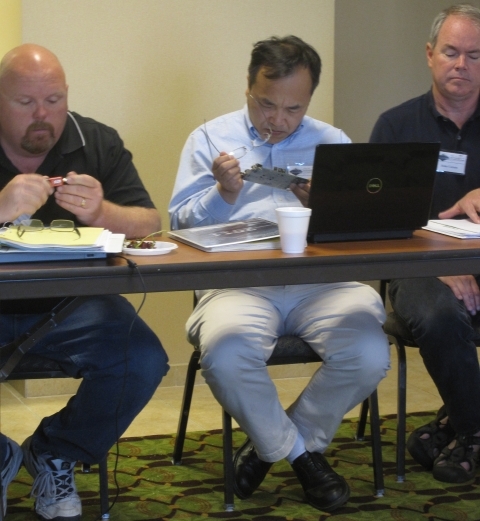 Yinhai Wang, center, and Jon Dickinson, left, examine parts of the Bluetooth reader device used by the OSU team for their antenna characterization project. 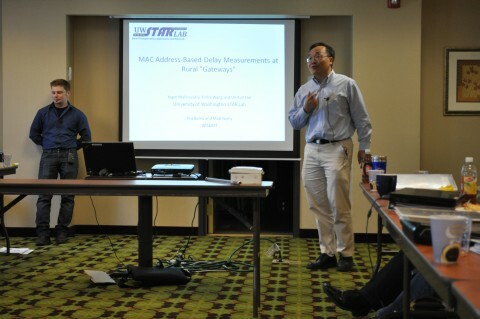 University of Washington graduate student Yegor Malinovskiy (left), along with his major professor, Yinhai Wang (right), presented research that is studying the use of Bluetooth technology to measure delays at rural “gateways” such as border crossings, weigh stations, and mountain passes. 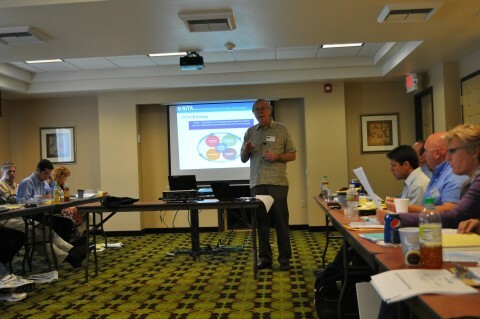 Here, Dr. Wang gives an overview and history of the project along with a broad discussion of objectives. 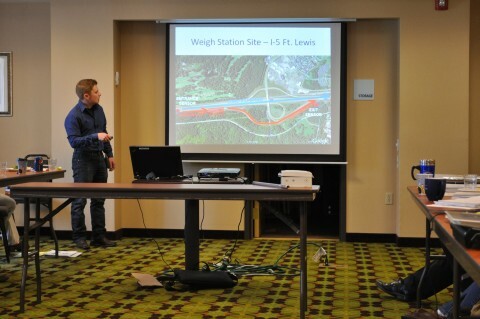 University of Washington graduate student Yegor Malinovskiy shows one of his project testing sites at a weigh station along I-5 at Fort Lewis. 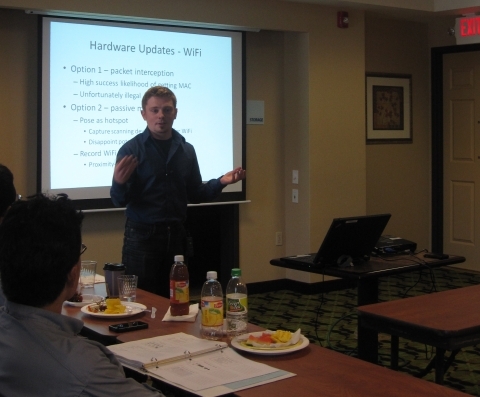 Yegor Malinovskiy, a graduate student at the University of Washington, explains some of the different options for updating the hardware associated with the Bluetooth reader devices. 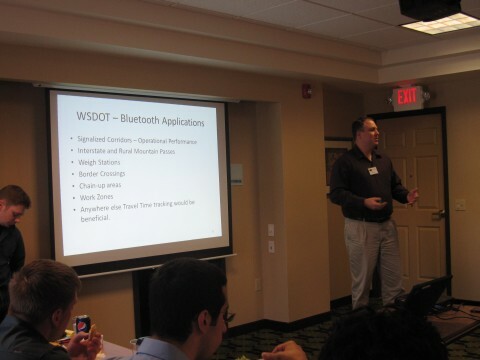 Ted Bailey, one of the Western States Rural Transportation Consortium (WSRTC) steering committee members, introduced the University of Washington project team and provided further information about potential rural applications of Bluetooth technology. Wednesday’s presentations included a luncheon speaker as well. 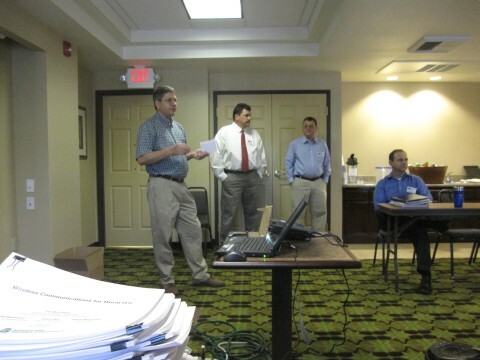 Mac Lister from the US DOT, RITA, ITS Joint Program Office, gave a brief overview describing the ITS Standards Program’s and ITS Professional Capacity Building Program’s project that is developing a new set of training materials for ITS standards. 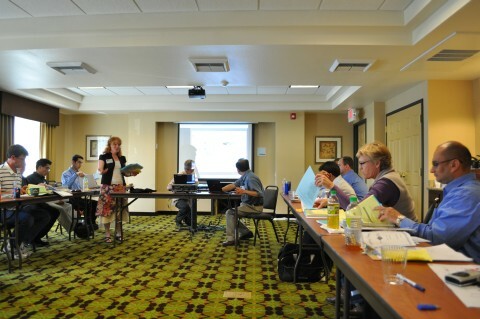 Forum participants listen to a presentation during the 2011 Western States Forum. 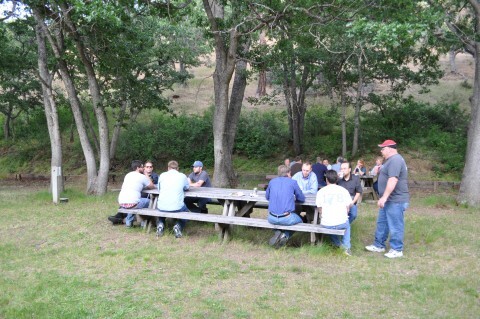 Opportunities to network are incorporated into the agenda during meals and with extended time for breaks. 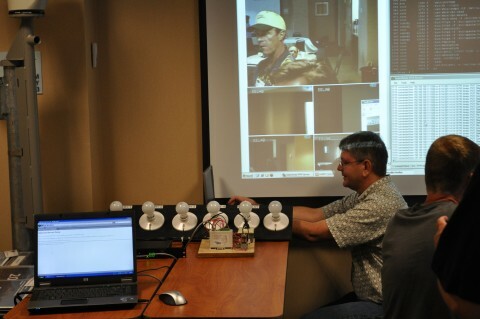 Sean Campbell (center) shows John Castro (back) and Stan Slavin (front) a remote power controller system. 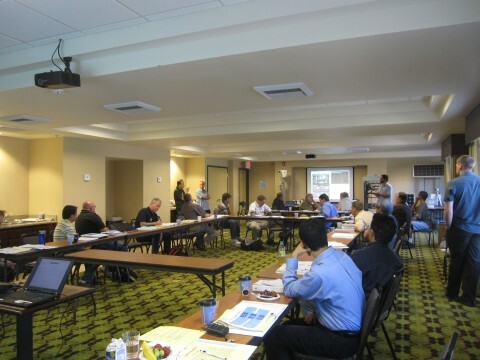 Questions and dialogue during technical presentations are an unique and important aspect of the Western States Forum. 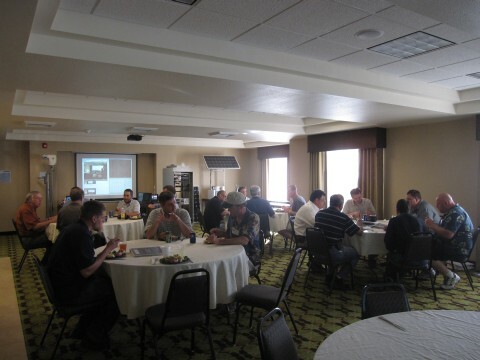 Networking sessions and meals provided a good opportunity for the Forum participants to discuss Rural ITS technologies and how these technologies are being utilized to improve operations and safety in their own district or state. 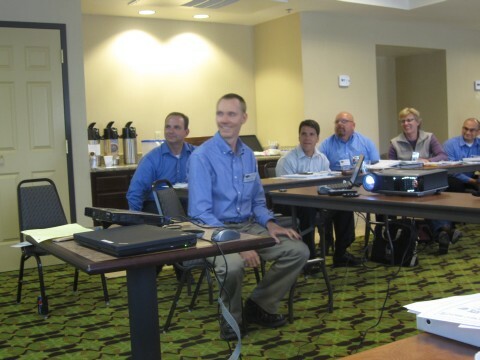 The Western States Forum offers participants the opportunity to network and share quality information and rural ITS experiences with practitioners from the western states region. 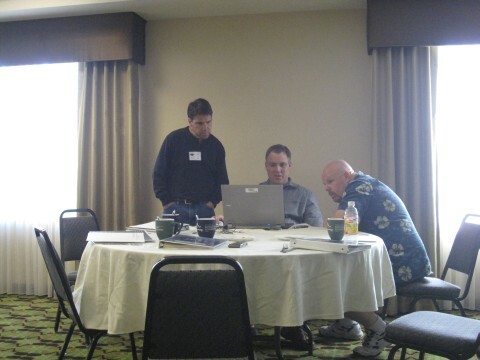 Ted Bailey (center) from Washington talks with Mark Aragon (left) and Jon Dickinson (right) from Nevada. Forum coordinator Leann Koon from the Western Transportation Institute reviews the Forum evaluation and explains the schedule for the networking session to follow.